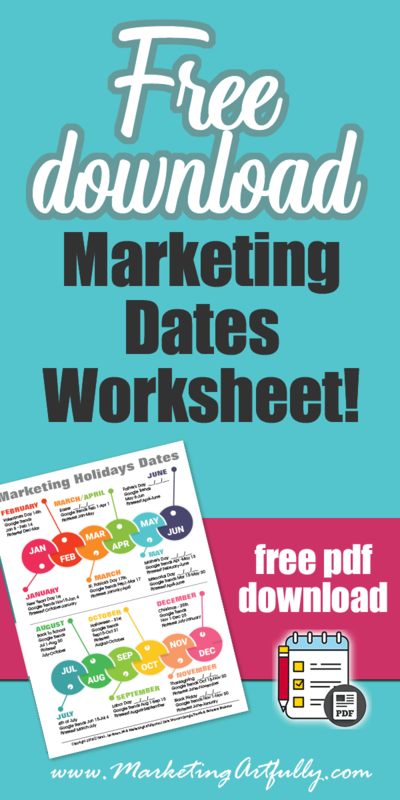 I have been obsessing about the marketing holidays lately and how to capitalize on the popularity of these special times for sales! 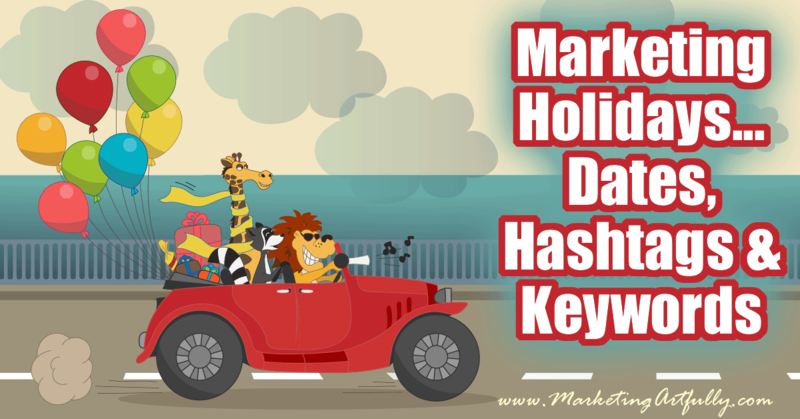 All my top tips and ideas in this super long and in depth article about the main marketing holidays including dates, hashtags and keywords you can use in blog posts and social media. 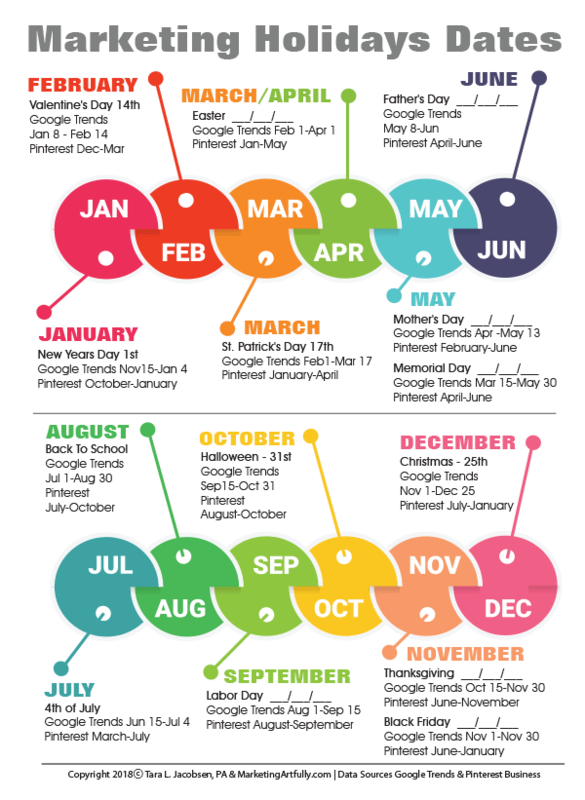 I have been obsessing about these A LOT lately and figured out that the “normal” way of doing these is to talk about the month the holiday is in, but in reality we need to be looking at it as a function of when we should start marketing! With this in mind, I breaking this out by holiday rather than month! Before I get started, I would like to talk about how I have come upon these dates. 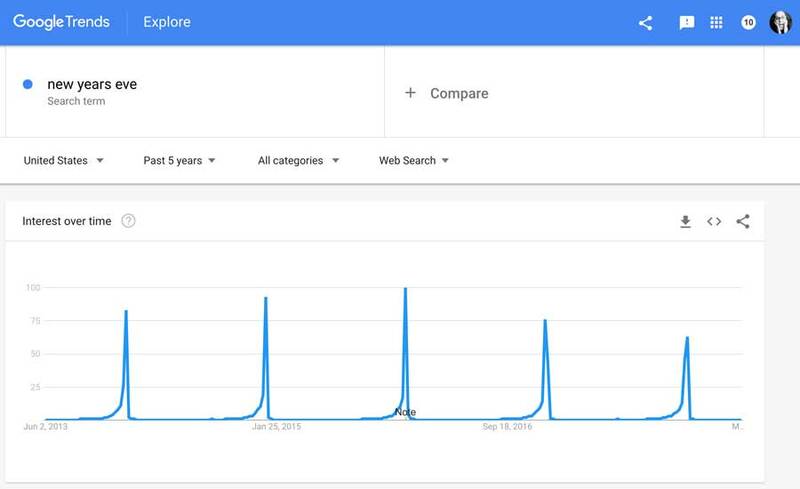 There is run-up to the event, a huge peak and then the precipitous drop when the holiday is over. This is the 5 year trend for New Years Eve, but it is like this for all the fixed holidays. Ones like Easter that move around are less fixed, but I figured out the amount of time before the holiday based on the peaks (see below). 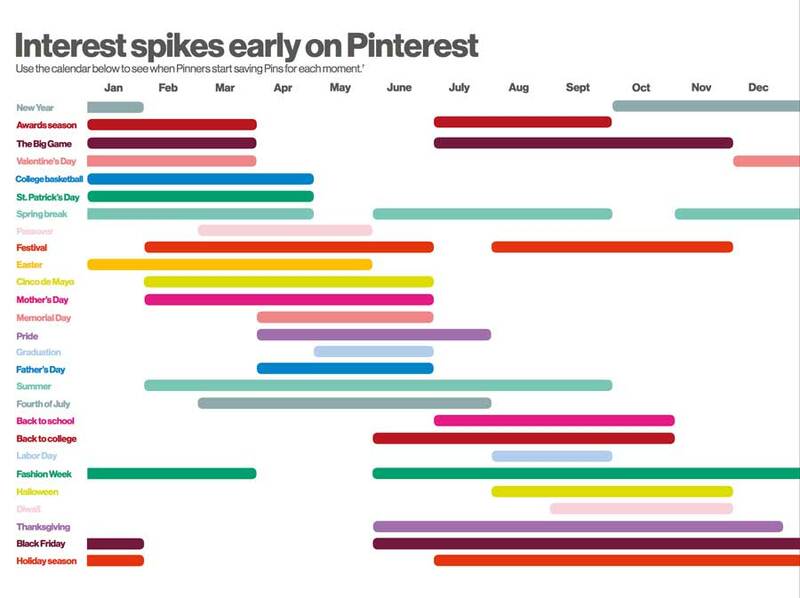 #2 Pinterest 2018 Planner– Pinterest put out a report this year that details timelines for major holidays on their platform. I have a wee bit of an inkling that it might be important for Ecommerce sellers as it shows when interest really starts ramping up for planning holidays and occasions. #3 Hashtags – I used the Hashtagify.me site to find related hashtags and then Instagram search to find even more! #4 Keywords – Last but not least, I used Ubersuggest to search for related keywords. There you have it! 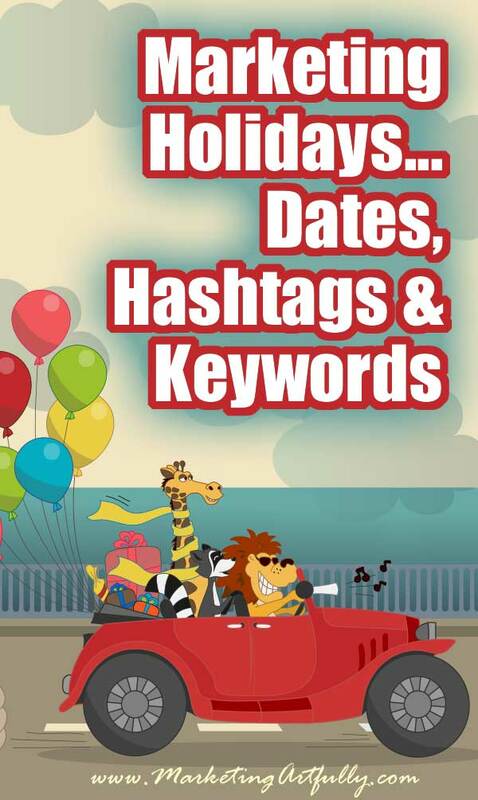 Some of the main marketing holidays dates with relevant keywords and hashtags. Knowing this data and being able to plan your marketing campaigns out ahead of time will make your planning simple and easy! 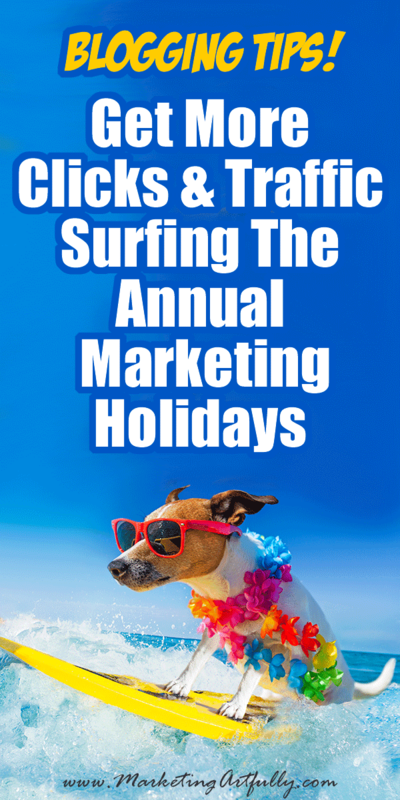 I thought it would be fun to show you in “real life” how targeting a holiday will work to grow your traffic and reach! So it is 4th of July here in the states, not a “popular” holiday at all, and in a dead time of year for my blog and sales. But just admitting defeat and saying that I am not even going to try is not in my vocabulary which is why I started trying to “ride the wave” of holidays in the first place! This first one is for my 4th of July and Patriotic Quotes page that I made a couple of years ago. It generated over 40K impressions on just the first 3 pins in Pinterest and resulted in 91 click throughs to my website. There are three “pins” shown there because one is mine and the other two are pins that other people shared to their own boards! And those are just the popular ones, there are many other pins out there that could be sending traffic to my site! In fact, Google and Pinterest have sent the same amount of traffic to this page over the last month! Now, is 300 hits to my 5 YEAR OLD POST going to set the world on fire? Probably not, but based on the fact that my traffic has dropped for my normal marketing posts because of the summer, every little bit helps! So now let’s look at a post that I wrote specifically to rank for holiday keywords this year. My post, How To Create An Amazing 4th of July Marketing Campaign (Independence Day), got some more traffic to my site this year, but my ultimate goal is to have it around for years and to keep increasing it’s views over time every July. So first off, I wanted to check and see which keywords it ranked for this season! 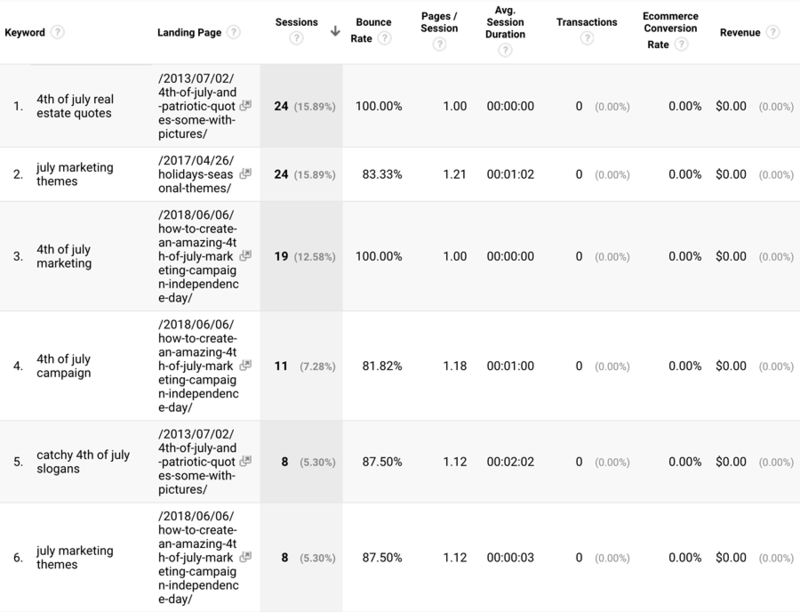 As you can see, my traffic was split, some of it going to this post that talks about seasonal marketing and some of it that talks about actual 4th of July focused marketing. Looking at this, I see that I was ranked somewhere in Google for “july marketing themes” because I did get a few clicks for that. So for NEXT year I want to make sure that I have that exact phrase in my post because it seems that people are searching for that phrase. Well doh, that is super easy to fix… I just added 4th of July to my “themes” subheader and will do better next year because of it! Just little tiny tweaks like this will make a huge difference in the amount of traffic you receive next year and since you are using actual data about what is working, you know it relevant for your page! Additional Resource: You could use the Google Search Console to reverse engineer the keywords that exact page ranks for, but I like using Keyword Hero because it compiles all that data for me automatically (#affiliatelink). In all I got 488 hits to that page this month, not a bad start with a post that is brand new and super niche targeted to one specific holiday!